Why buy your tickets from VillaDirect? There are more than a few “shady” vendors offering theme park tickets at slashed prices. VillaDirect encourages our guests to be careful. 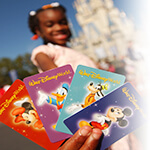 Make sure you purchase your tickets from an Authorized Walt Disney World Ticket Seller. Buy your authorized attraction tickets from VillaDirect and peace of mind is part of the package. We sell discounted theme park tickets directly from Walt Disney World® Resort, Universal Orlando, SeaWorld and many more popular attractions. VillaDirect only sells new, unused, authorized and genuine tickets. As a result you can be confident there will be no “surprises” at the theme park gates! Don’t be tempted by what look like “cheap” ticket deals at gas stations… it’s almost always a scam! Tickets can appear to be as much as 20, 30 or 40% cheaper. That’s probably because they’re used or counterfeit tickets. Like many guests before, you could also be turned away at the theme park turnstile and the tickets confiscated at the park! While you’re here, check out the VillaDirect attraction tickets page for options and information.